Concrete Solutions products by Rhino Linings will be featured at World of Concrete in outdoor booth #O40843. Decorative concrete artists will be demonstrating eight resurfacing systems, including Concrete Solutions® award-winning Trowel-Top™ resurfacing system, which offers a smooth finish, similar to polished concrete, FastFloor®, our rapid-curing polyaspartic system that can be installed in one day, and our three-dimensional metallic epoxy system. 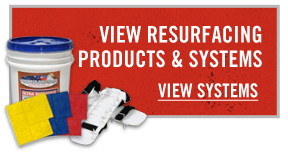 In addition to these popular products and systems, we’ll demonstrate Spray-Top®, a revolutionary polymer cement product developed for restoring old, stained or smooth concrete to a like new solid color or decorative finish. Spray-Top is sprayed in the same manner as paint, so that the existing texture is preserved under one thin application which is especially important when applying over stamped concrete surfaces. New products and equipment will also be showcased including OnFloor™ polishing machines, an easy roll-on resurfacer system and our vertical ¼” stamping mix.